A strong and seaworthy hull – preferably a heavy displacement long keel or semi long keel. She doesn’t need to be super fast, more importantly she should behave well at sea. Not jumping around too much or rolling/leaning over heavily as we will mostly have people on board that are unfamiliar with the ocean. Lots of deck space for activities on deck while sailing and at anchor – Of course a high railing all around. Proper space to do maintenance, have tools and gear stored – enough room to teach kids some handy skills too. Lots of storage space. After all the two Minicats also need to come, besides lots of other adventure equipment, spare parts, sails, books, hiking, climbing and good foul weather gear for everyone onboard. Big wheel house with a good view, so that kids can be inside in case of bad weather and still see the ocean to observe and feel its power and beauty. I want to avoid the “being stuck in a hole down below deck and getting smashed around” kind of feeling. Lots of open and communal space. Good size kitchen open to dining area so it’s all a bit more of a social happening. Opening transom when at anchor, as a swimming platform and dock for dingy’s and little sailboats. Why build a new ship? I began quietly searching for a ship two years ago, asking around and searching the entire internet for a suitable vessel. We want to keep the program as affordable as possible, and therefore it is important that the ship is as maintenance free as possible. We did also find some well maintained boats, but then they weren't suitable. Most of them were made as luxury yachts which is not what we're looking for when sailing with youth. I looked at a beautiful boat in Croatia and came along for a week as crew on one of it's charters, but realised quickly she was unpractical for long voyages and too much work to transfer from a luxury yacht into a practical moving school. The more we searched and spent time on Ships we realised the enormous amount of time and money needing to be invested in any of these boats in order to make them suitable - on top of that stayed the ongoing maintenance costs of an older vessel, especially when build in wood or steel. We calculated and puzzled and searched the internet for months and months to find the right boat, it would cost right into the million to get any of these boats ready. However after looking at so many boats and thinking about how to make them work, I did get an even better idea of what the ideal ship should be like. 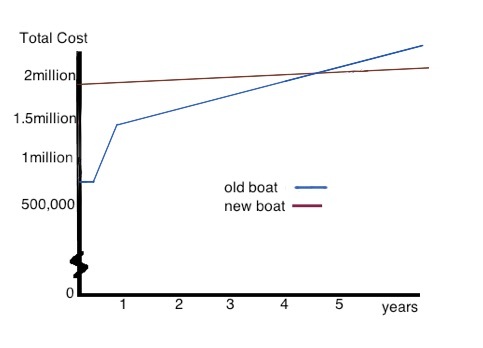 Eventually I came to the conclusion that it doesn't make much sense to buy an old boat - the costs for refit and upkeep would exceed the cost of a new build ship within 5 years. Below is our estimated scale after months of research - Figures are in Euro. With older boats not only the maintenance and refit should be taken into account but also the safety. Even though older vessels can be very safe and seaworthy they still need to comply with the modern safety standards - which have been made much stricter. Therefore old ships are for sale relatively cheap but will need to be upgraded to the new standards. Things ships are being tested on include but are not limited to: structural strength, construction materials, stability, watertight bulkheads, watertight integrity, hatches, port lights, windows, doors , Materials for valves and piping, Machinery, Electrical, General Systems, Damage survivability. When we build a new boat all these things can be taken into account and build right to start with, ensuring for a safe vessel that will comply with the modern safety regulations. The way I look at it is that we have to build a new boat anyway, whether we completely rebuild and old boat or start from scratch on a new one, the amount of work and money doesn't seem to make much of a difference, but the end result does! Will need more maintenance over time, therefore will already outrun total cost after 4-5years. Could take a little longer until program is running because more funding is needed to start therefore will delay start of building. Will be purposely designed and therefore perfectly suited for this goal. She shouldn't be to big, a smaller ship means a smaller group of students. They will be a much closer group in the end than when there's 30 or 40 kids aboard, fights and splitting up in groups would be a real issue with such a number. However with a group of 12 students we believe the quality of life onboard and things learned will be much higher. Another reason for choosing to stick with a ship length of 24meters and 12 students is the regulations - With more students and a bigger ship, you get into the large vessel category, which means much more paperwork with many more costs. I personally think that a length of 30meters would be better, but the extra gain in length doesn't outweigh the cost and hassle that comes with a ship of this size in paperwork and regulations.